Each site should be as unique as possible - if the same link scheme, cookie names and directory structure repeat over and over again on hundreds of different sites, this can have a negative impact on search engine rankings. 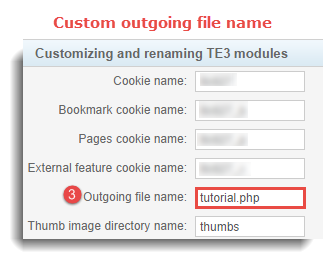 We have implemented several different options for customizing and renaming TE3 modules and we strongly encourage you to make TE3 on each of your sites more unique - it may take some effort but you'll be avoiding potential complications related to search engines. 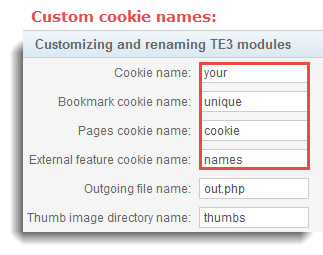 TE3 uses up to four types of cookies - ''in.php'' module sets up a basic cookie and a bookmark cookie for each visitor of your site. 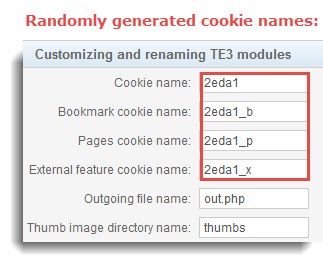 If you are using “Pages” module, Te3 sets up a Pages cookie, and if your External feature is enabled, TE3 sets up an external feature cookie. Cookie names are randomly generated at the installation stage. Although not necessary, we advise you to rename them manually - search engines will recognize actual words as more authentic than computer generated ones. If you manage several websites, be sure to create unique cookie names for each site. Navigate to “Main header” and select “General settings” from the Settings menu. 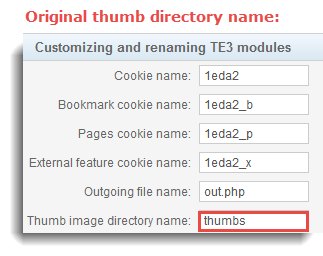 Expand “Customizing and renaming TE3 modules” accordion. Click to confirm your customization. 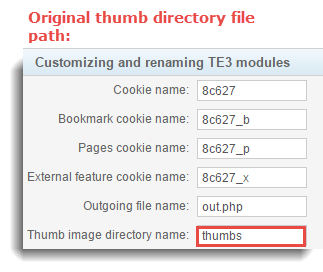 Change the original thumb image directory name from “thumbs” to a name of your choice. 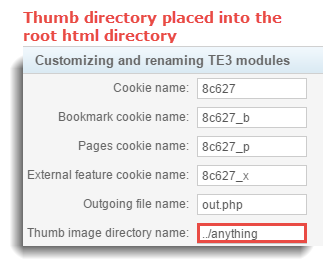 Simply change the original thumb image directory name from thumbs to a name of your choice. We chose anything. Place “thumbs” directory into the root html directory of the domain (public html) using “dot dot slash” (../). Put “dot dot slash” (../) in front of thumb image directory name (we also changed the original thumb image directory name into anything). Note, if you are not able perform this customization directly from TE3 admin panel (due to server permissions), you will have to place “thumbs” directory into the root html directory using FTP. Change the original toplist directory name from “toplist” to a name of your choice. 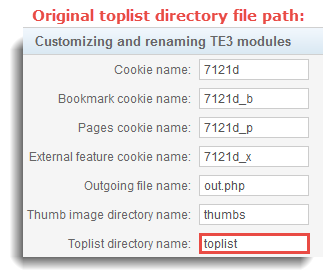 Simply change the original toplist directory name from toplist to a name of your choice. We chose something. 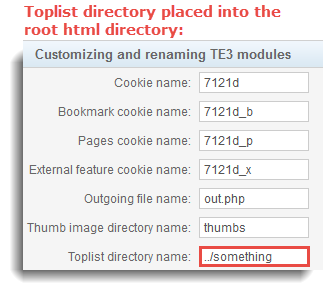 Place “toplist” directory into the root html directory of the domain (public html) using “dot dot slash” (../). Put “dot dot slash” (../) in front of toplist directory name (we also changed the original toplist directory name into something). 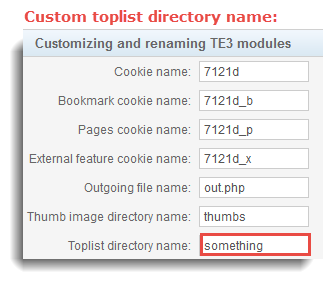 Note, if you are not able perform this customization directly from TE3 admin panel (due to server permissions), you will have to place “toplist” directory into the root html directory using FTP. When you rename out.php in your Customizing and renaming menu, file name automatically gets renamed as well. This method could prove problematic if you have an existing site. When you rename out.php, all links on your site will immediately become broken. If your site is already getting traffic, we recommend the 2nd method instead. Simply rename outgoing file from the standard “out.php” to a name of your choice. We chose tutorial.php. Note, that this is just an example - you should choose a unique name for both your_te3_directory and for anything.php. Only use lowercase alphabet signs, numbers and _ instead of spaces and be sure to leave file extension .php intact when you rename out.php. The advantage of this method is that if your site is already getting some traffic, surfers won't experience broken links on your site while you are switching links from old to the new paths. In general this method might be better for both, existing (running) site and new site alike. If you include out.php directly into the root html directory of the domain (public html) it will make your website even more unique. We recommend this method, since BOTH links work at the same time and you won't experience broken links on your site while you are switching them from old to the new paths. You can customize “standard” TE3 out.php parameters by appointing them names of your choice. You can choose more than one name for a single parameter (e.g. id: domain,d,name). If you decide to reconfigure outgoing tracking, you'll have to modify all clickable links on your site. This could be problematic if your site is already getting some traffic. We advise you to retain the original out.php parameter name as one of the appointed parameter names in order to avoid potential problems (e.g. id: id,domain,d,name). This will prevent surfers from experiencing any broken links on your site while you are switching links from old to the new paths. 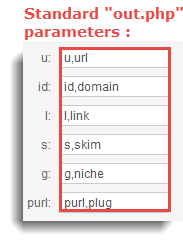 If you manage several websites, be sure to create unique out.php parameter names for each site. 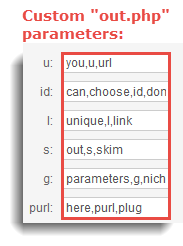 Rename “out.php” paramters - you can even choose more than one name for a single parameter. Remember, if your site is already getting some traffic, we advise you to retain the original out.php parameter name as one of the appointed parameter names.